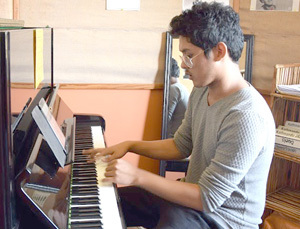 The young, outstanding, and passionately driven virtuoso classical pianist, Nirantar Yakthumba is no ordinary teacher. Having been absorbed in music, and especially in western classical piano ever since the age of 8, he is one of the finest classical pianists in Nepal, and one should consider themselves in great hands with him as their teacher. However, he will expect you to be as persevering and passionate about learning as he is about teaching. For him, music is about much more than learning a mere instrument one can learn to play or master. It is a crucial dimension of creativity. Bach, Rachmaninoff, Chopin, Beethoven, Ravel, and Debussy are only a handful of the many western classical composers he enjoys playing and listening to, and from whom he draws much creative inspiration from. KJC and Nirantar have had one of the oldest and most precious relationships, with him starting piano classes with Mayo Shimonishi (classical pianist from Japan) at the age of 10. Not only did he fully engross himself in Classical Piano with Mayo, he even attended master-classes and workshops with well renowned musicians from all over the globe, namely, Roman Rudnytsky and Adolovni Acosta from the USA, Makiko Seo from Japan, Anna Kijanowska from Poland, and Erica Lopez from Spain. And with a background in music as immense and as thorough as his, he has also directed a classical choir here at the conservatory itself. Aside from his classical layer, he has allowed himself to explore and enrich his musicality in other genres such as jazz as well. This side to him has steered him to attend workshops and collaborate with jazz musicians from around the globe, namely Dr. Gene Aitken from the US, and Natalia Calderon and Sonia Megías from Spain. He also played in a KJC jazz combo with Heyshe D. Sherpa and Marcus Dengate. There’s only so much one can put in words about what seems like a lifetime of experience Nirantar has had with music. One has to take classes with this mastermind, in order to truly experience what learning music is like.